In the latter part of the nineties (late twentieth century), the L.E. 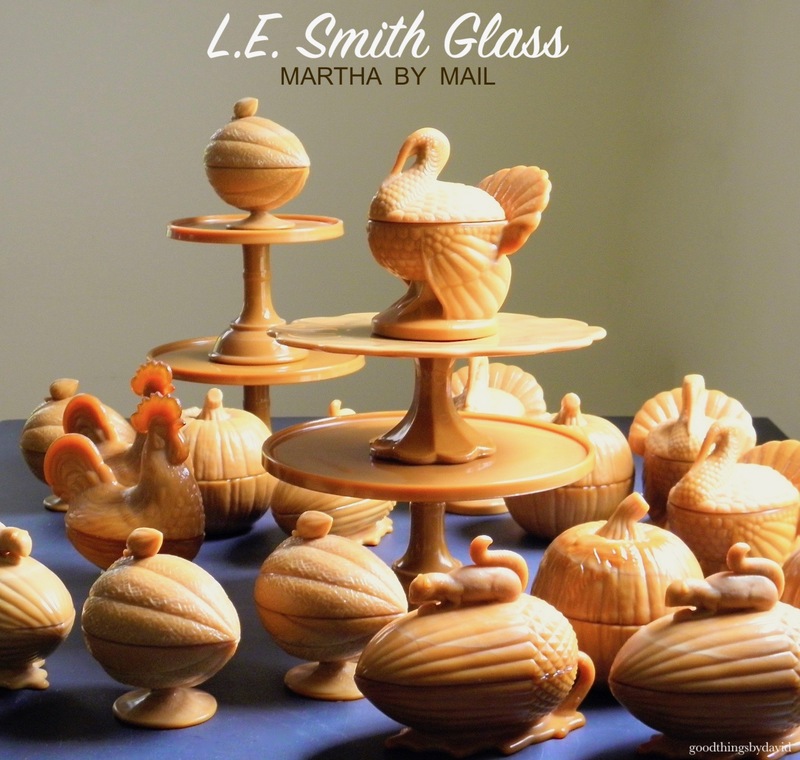 Smith Glass Company of Pennsylvania manufactured a special shade of glass, called caramel glass, for the Martha by Mail catalog. 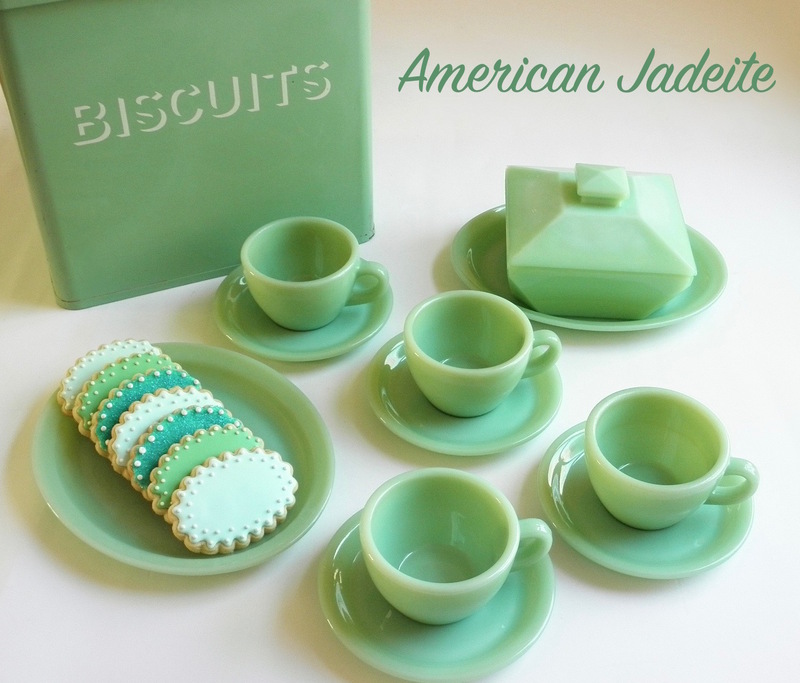 This particular color was used on a limited number of glass items that were already being produced for Martha Stewart Living, back when their exclusive catalog was in business. The production run for this shade of glass lasted for less than a handful of years. Many of us collectors tend to classify this particular opaque glass as 'slag glass', while others label it chocolate glass, brown glass, and of course, caramel glass or caramel slag glass. Make a note of it while searching for pieces online. Not everyone is going to call it caramel glass. Slag glass is characterized by swirls or whorls of cream or white glass mixed in with the dominant color portion of the dish. Antique slag glass was actually made by combining molten metal ores with molten colored glass in order to produce that swirled multi-toned finish. More recent glassmakers, however, employed a simple mix of two colors of molten glass to produce the whorls found throughout the pressed glass. When Martha by Mail commissioned the L.E. Smith Glass company to make their exclusive shade of caramel glass, the Pennsylvania glassworks used the technique of mixing small amounts of cream-colored glass into the caramel glass, in order to make each vessel unique. Not one covered dish or cake stand in my collection is exactly alike in coloration. Every single dish has a distinctive hue pattern. 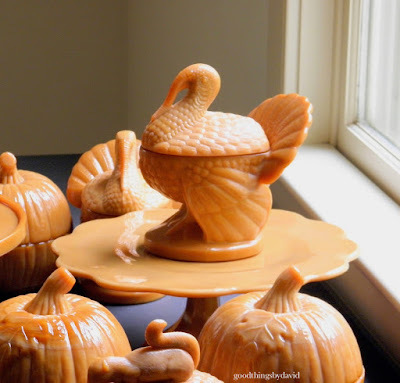 To my mind, they are the quintessential autumnal shade that I like to use this time of year, because the tone is warm, soothing and ideal for any fall table arrangement. Since these covered dishes and cake stands are appropriate for table settings in October and November, I like to have them out in the kitchen or in the dining room where they are easily accessible. 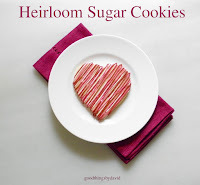 Let me show you every single covered dish and cake stand that the former glassworks of L.E. Smith made for Martha by Mail in this wonderful shade of caramel. Over the years, I've managed to add a piece here and there whenever I find them. Some covered dishes are more difficult to procure than others. The cake stands themselves are probably the rarest of pieces to find these days. 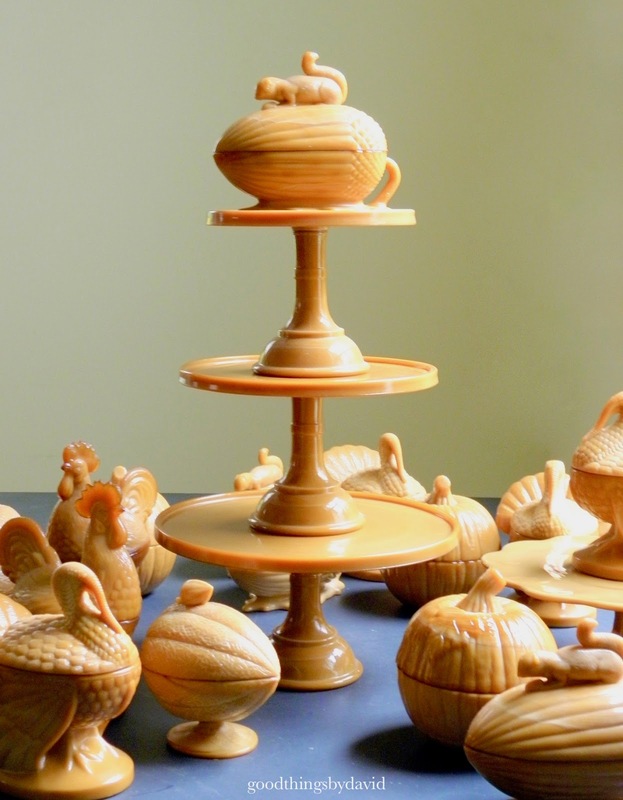 These are the plain round cake stands that measure 8", 10" and 12" in diameter. I absolutely love the cupped bases, and the lipped plates. They make just about any dessert look tempting. 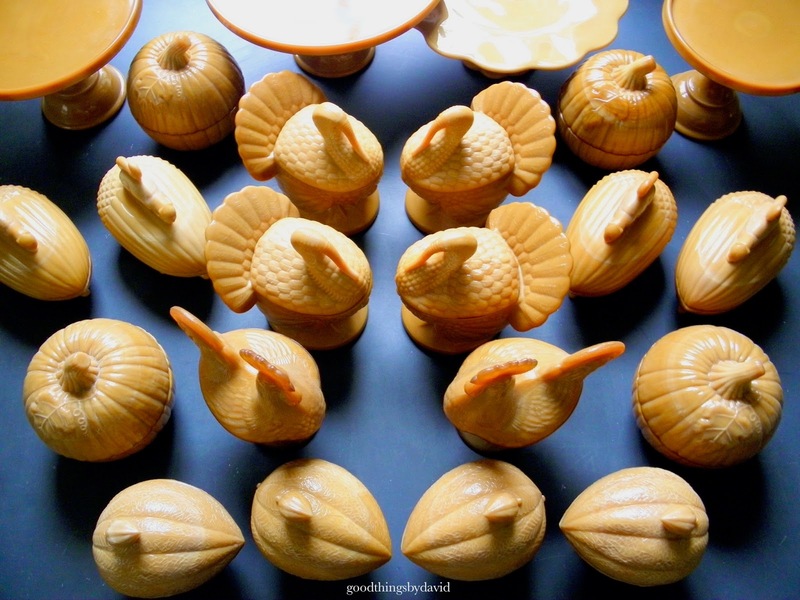 Think of placing a pumpkin bundt cake covered in a delicious drippy glaze on one of these, or use them to showcase this year's Thanksgiving pies. 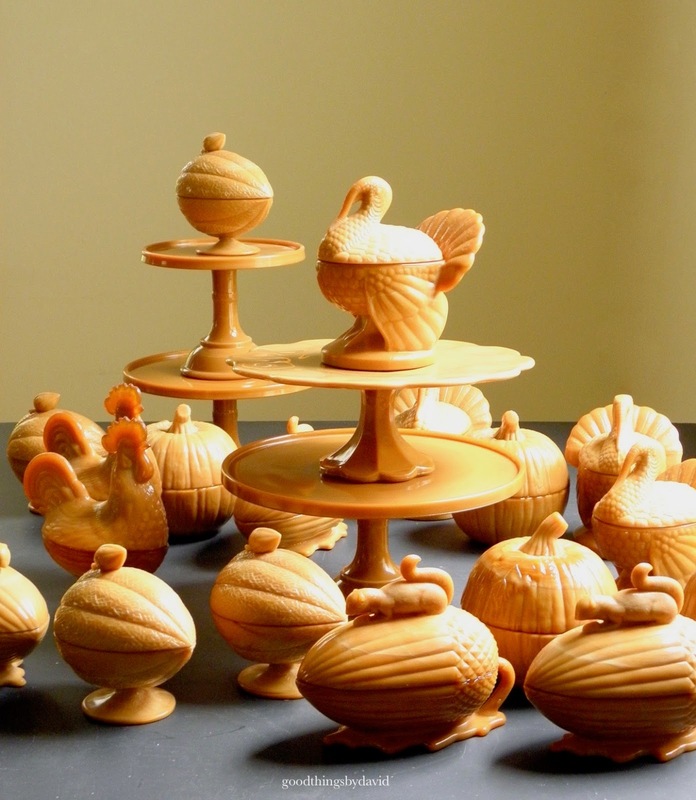 Pumpkin, apple, pecan or even a cranberry pie would look amazing. The beautiful scalloped cake stand is a recent addition to the collection. The design pattern of this particular shape is called 'Dominion' or 'Dominion-Honeycomb'. It features a faceted scalloped base, and a scalloped-edged plate which has an intricate honeycomb pattern underneath. I can say without a doubt that this cake stand is probably the rarest piece of caramel glass from Martha by Mail. Collectors don't want to part with them. 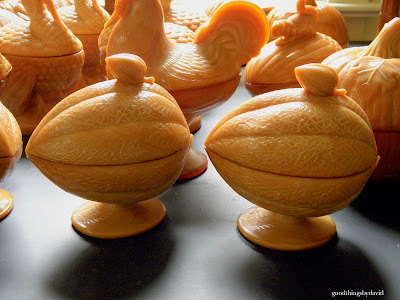 The covered turkey dish is one of my favorites to use for Thanksgiving. 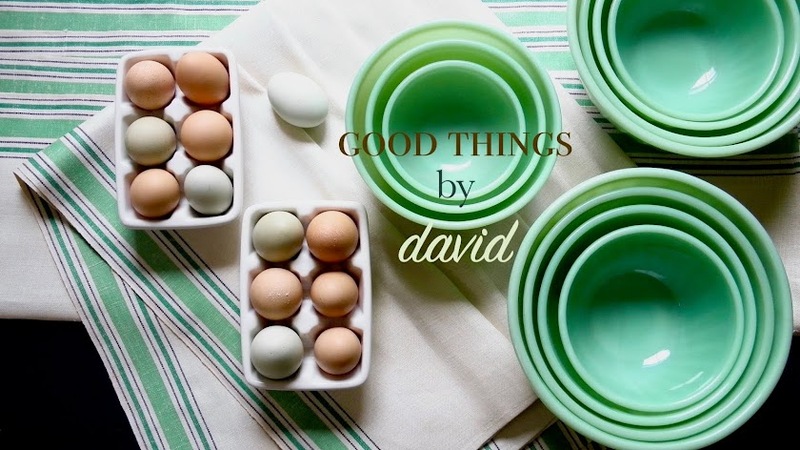 Sitting quite regally, the dish can function as a centerpiece, it can be used to serve soup during dinner or it can be a part of the dessert buffet to hold whipped cream for pies. I don't know why, but the caramel turkey dishes are a bit difficult to find these days. They pop up every now and then, but I think that collectors are holding on to their pieces because they truly are beautiful. The charming squirrel and acorn covered dishes are always available online. 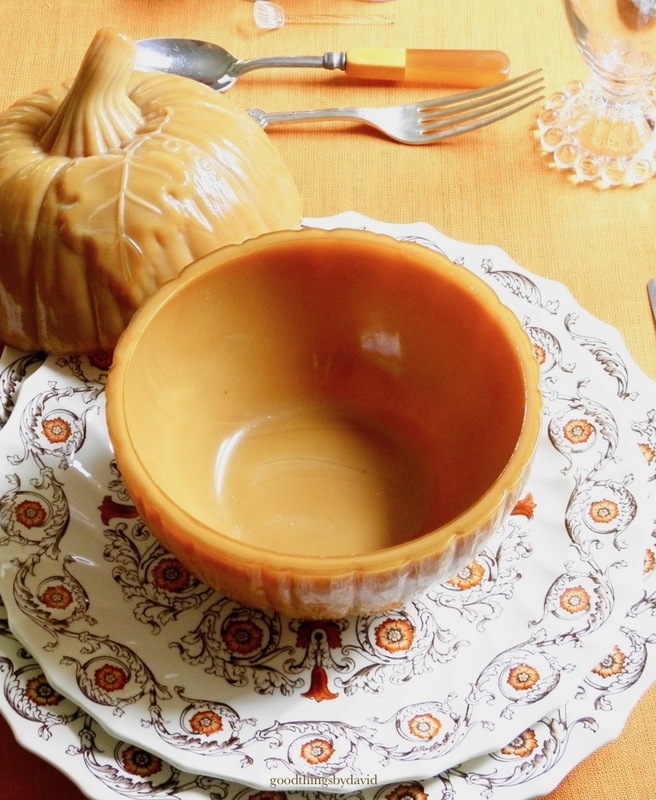 These are the perfect bowls for butternut squash soup. I love how the footed base has a leaf pattern to it, and I adore the shape of the acorn with its ribbed and diamond-patterned sections. The footed melon dishes are works of art. This is another one of my favorite pieces because the texture of the melon and the veining of the leaves is truly exquisite. That small bud on top of the melon is what makes this piece a keeper. If you ever come across this particular dish, buy it. You will not regret owning one. 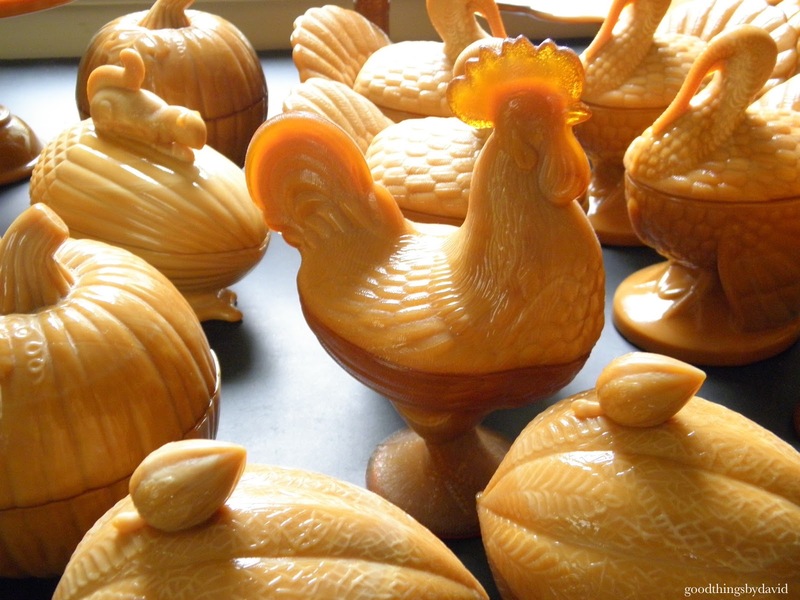 The caramel glass rooster is interesting because it has very realistic qualities to it. The cockscomb and wattle are done to great effect, and the plumage on the body and tail are fascinating. I believe this original mold used to belong to Westmoreland. The bowl of the rooster covered dish is not very capacious, so this particular dish is great for serving scrambled eggs. 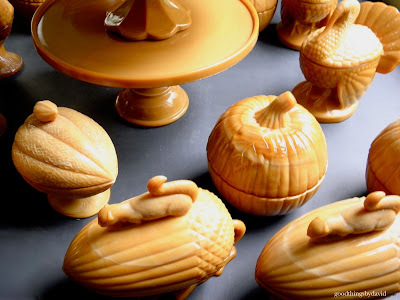 Another favorite of mine is the pumpkin dish. 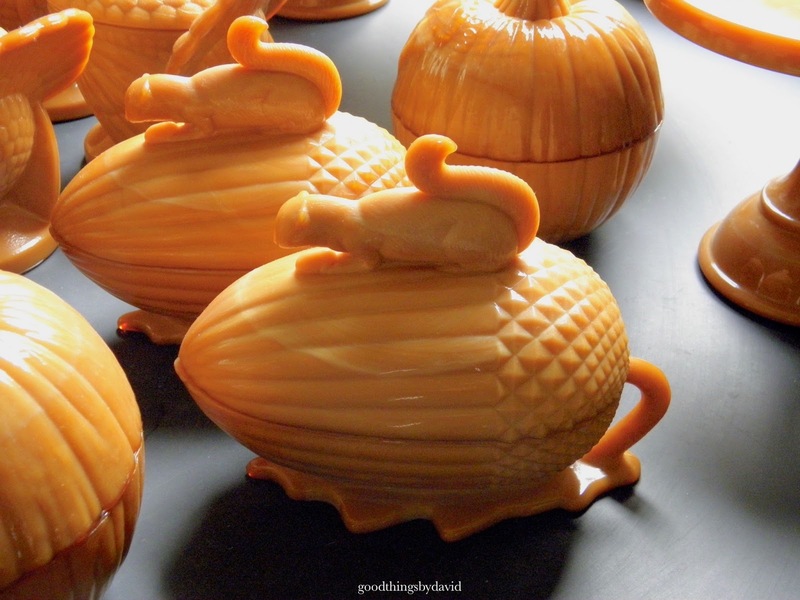 Do not confuse this particular pumpkin with the one that was made by Longaberger. Although both are equally charming, they do have distinctive leaf patterns. The one by L.E. Smith is a bit more subtle, while the one from Longaberger is more pronounced. I love using mine to hold candy! By the way, if you look closely, you can see how gorgeous the slag glass coloration is on this particular pumpkin of mine. Sheaves of wheat pair well with caramel glass dishes. 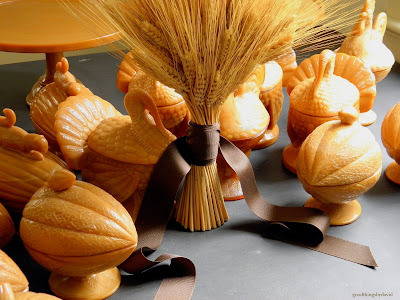 A gathered bunch of wheat stalks like this makes a good centerpiece for a dining table, a coffee table or even a sideboard. 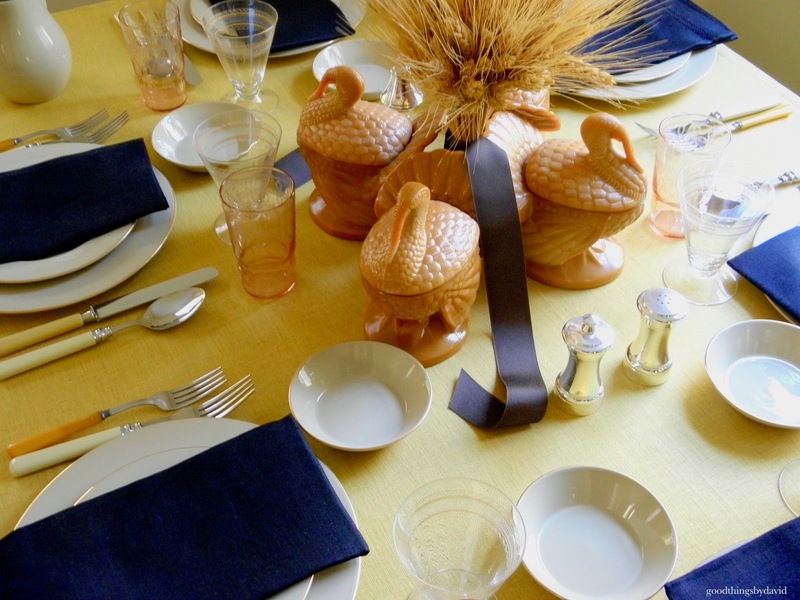 Last year's Thanksgiving table had a simple centerpiece of sheaves of wheat surrounded by a quartet of caramel glass turkeys. For your table this year, you can place any combination of these Martha by Mail covered dishes and, if you're not going to use them at each place setting, you can fill each one with nuts and dried fruit, or you can use them as containers for delicious gravy. I loved this particular place setting from a couple of years ago. Used as bowls for acorn squash soup, the caramel glass pumpkins looked irresistible placed atop this transferware china from Spode. Whether you label it chocolate, brown, slag or caramel, this distinguished glass from the former L.E. Smith Glass Company of Mount Pleasant, Pennsylvania, is highly collectible now. 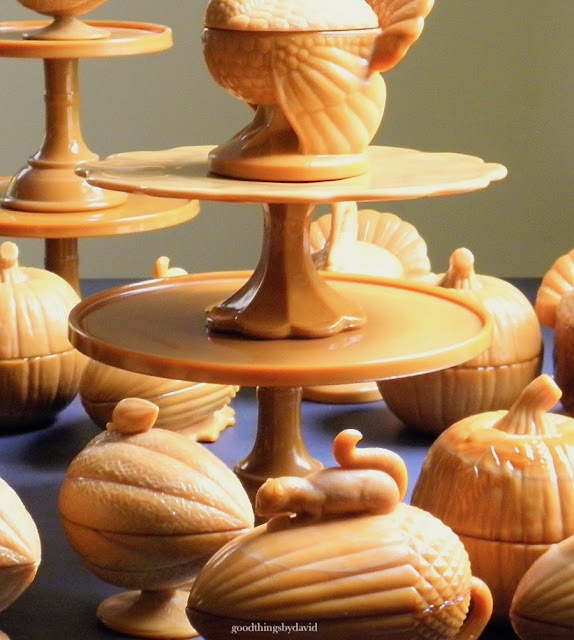 Prices for Martha by Mail caramel glass vary from around $30-$40 per piece, to well over several hundred dollars for the much-coveted cake stands. If you're fortunate enough to have one, two, three or more of these caramel glass dishes in your home, please use them in the coming weeks. They are going to be a welcome addition to your living spaces. If you don't own any Martha by Mail caramel glass yet, start looking for them online, in antique shops (they do pop up there) and in consignment shops. You are going to become enamored with it once it arrives in the mail.